Chipping a tooth can be sometimes painless. The pain will depend on how big the chip of the tooth is. If you recently chipped or have chipped your tooth, it is very important to consult with your dentist. It is important to consult with your dentist because the dentist has to take an x-ray to make sure there is no trauma to the tooth. It is also important to consult with your dentist because most small chips are repairable or savable and will not need other major treatment. What causes a tooth to chip? There are many ways a tooth can chip some frequent ways are biting, teeth grinding, trauma, or decay. Teeth are very strong but if you bite something that is very hard it can cause the tooth to chip, the pressure you put on the tooth will cause it to chip. Bruxism or teeth grinding is also a common way, it is important to wear a night guard if you grind your teeth at night. Hitting your tooth on accident can fracture or chip your tooth. Decay is another way a tooth can fracture; the caries softens the enamel causing it to wear off. What to expect from a chipped tooth? If you have a chipped tooth you might experience some sensitivity. The amount of sensitivity will be based on how much tooth structure is missing. The closer it is to the nerve the most sensitivity you will experience. Some discomfort is normal if the chip is recent, if you are experiencing heavy or pulsing pain then your tooth might have a problem. Your tooth can also begin to loose color if there is trauma on the tooth, it will usually turn dark colored. How can I fix my chipped tooth? You have different options in fixing a tooth that’s chipped. Our Santa Ana dentist Dr. Danial Kalantari always gives options in fixing a chipped tooth. He gives his options based on what is best for his patients and what is going to help them long term. If the tooth has small chip, your dentist can polish it to even it out with the rest of your tooth or place a composite fill to replace the missing area. Another option could be capping the tooth or what is known as crown. This is a good idea if the tooth has a large chip. The last option could be placing a veneer if it’s a small fracture and it’s in the anterior area. All patients’ cases and chips are different, it is best to check what treatment is best for you can consult with your dentist or with our Santa Ana dentist Dr. Danial Kalantari of Smiles on Bristol Dentistry. This entry was posted in Uncategorized and tagged chip tooth, dentist in santa ana, santa ana dentist, Smiles on Bristol on February 26, 2016 by Francisco Torres. Radiographs also known as x-rays are an essential part in the dental field. Radiographs help the dentist diagnose for a better treatment plan. Radiographs can help the dentist find cavities, check the bone structure of the teeth, see teeth development, and find any cyst or abscess. Radiographs can also be a preventative measure by helping the dentist take care of the patient’s oral care issues before they become a major problem. There are two different type of x-rays Traditional X-rays vs. Digital X-rays. Traditional X-rays are x-rays that are taken on a film. The film has to be develop in a dark room using special chemicals and has to be placed on a light board for the dentist to see. Traditional x-rays are being used less in the dental field. The reason that they are being used less is that they require more radiation than the counter digital x-ray. The chemical that is used for development is hazardous and it can be a hazard to an employee. Digital X-rays are taken through a sensor. The digital sensor comes in different sizes and it’s more comfortable than the traditional film. The amount of radiation that is needed to take a digital x-ray is also less than traditional film. The processing is also much faster since there is no need to use darkrooms or developer chemicals. The digital x-ray is almost instant takes a few seconds for the x ray to appear on a screen. At Smiles on Bristol Dentistry in Santa Ana we use digital x-rays because it benefits patients and employees. Our Santa Ana Dentist Dr. Danial Kalantari also agrees with using digital x-rays instead of traditional. Dr. Danial finds it easier to explain x-rays to a patient. 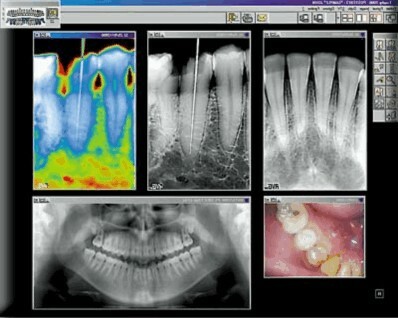 With digital x-rays you can zoom, measure, and expand an image. You can also e-mail x-rays keeping the image at the best quality. This is very important if a patient has to see a specialist or another dentist the patient doesn’t have to retake x-rays. Dental X-rays have very low radiation levels, comparing to other medical x-rays. It is very important to keep x-ray as minimal as possible. With digital x-rays the amount of retakes should be less since the image appears instant and are much easier to place. The main goal in taking x-rays for Smiles on Bristol Dentistry is patient safety. Smiles on Bristol Dentistry in Santa Ana requires all their employees operating the x-ray unit to take an x-ray course and have a valid x-ray license. Whatever method of x-rays your dental practice performs, it’s important for you to wear a shield or lead apron to protect you from scattered radiation. If you have any questions regarding radiographs, feel free to contact your friendly Santa Ana dentist Dr. Danial Kalantari. This entry was posted in Uncategorized and tagged dentist in santa ana, Radiographs, santa ana dentist, x-rays.smiles on bristol on February 25, 2016 by Francisco Torres. At Smiles on Bristol we offer a clean and sterilized environment. We offer this by having a clean office and clean instruments. 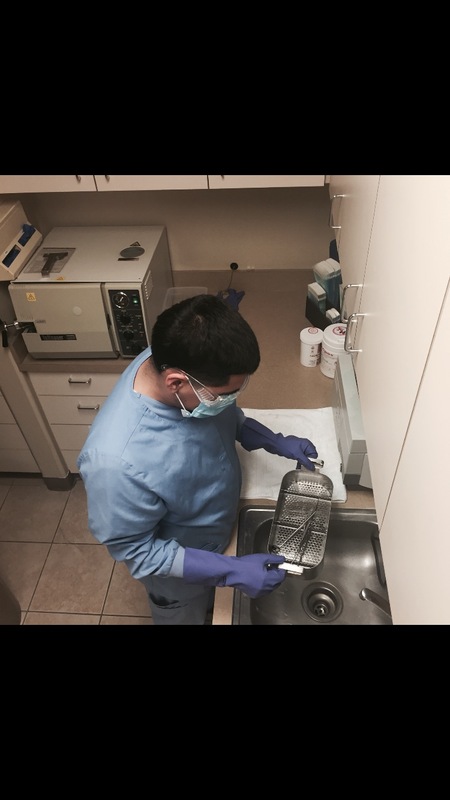 A cleaning and sterilization process that meets the ADA and CDC standard regulation guidelines is done to all instruments after being used after a treatment. You might ask what this sterilization process is. This process is the elimination all microorganisms and all other pathogens from any object and/or surface by the use of a chemical or exposing it to high heat. When sterilizing there is the need of proper materials, and other devices. We not only use the proper materials and devices here at Smiles on Bristol but we also ensure a method by having clean area: used to place all clean instruments which have not been yet used or have already being processed by sterilization. There is also the dirty area: used to place all instruments which have being used in patients mouths and have yet to be processed by sterilization .By ensuring this instruments which are placed on the dirty area are the ones which need to be emerged into the Ultrasonic cleaner, with the use of cavitation bubbles and high frequency pressure waves, used with liquid this helps penetrate through cracks, blind holes and any other recesses in instruments before being bag in special pouches that will be placed into the autoclave. This autoclave is set to a high temperature of 270 degree steam , this high temperature eliminates all microorganisms. 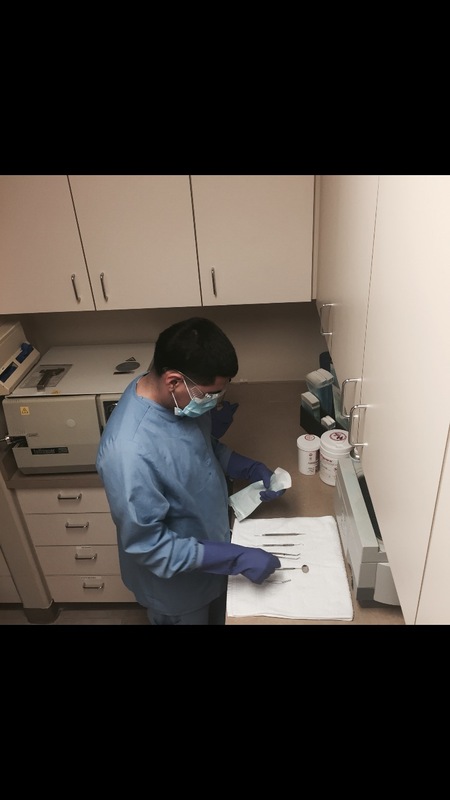 This entry was posted in dentist, santa ana, smiles on bristol, Uncategorized and tagged cleaning and sterilization, dentist in santa ana, santa ana dentist, smiles on bristol dentistry on February 20, 2016 by Francisco Torres. 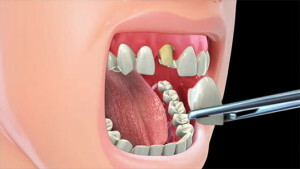 Amalgam fillings or silver fillings is a common material that is used by dentist to fill a cavity. Amalgam is made of alloys of mercury and other metals like silver, tin, and copper. These materials are mixed together to create amalgam; your dentist will use this type of filling material to restore the damage part of the tooth. Amalgam has been used in de ntistry for about 150 years. There have been many studies involving this type of filling material by the FDA and they concluded that is safe for adults and children over the age of 6. Patients have question the use of amalgam in the dental field. Most patients are concerned with putting metal in their mouth. They think that putting metal in their mouth can lead to serious illness in the future. They also oppose the use of this type of filling because how it looks inside the mouth. It doesn’t match the natural tooth enamel. According to many studies from the American Dental Association they have concluded that dental amalgam is safe to use, and there’s no justification for discontinuing the use of amalgam. Our dentist in Santa Ana Dr. Danial Kalantari usually recommends to his patients composite resin fillings. Composite fillings are white color tooth fillings that match the tooth enamel. Composite fillings require less drilling, there’s different shades that can match the same color as your tooth. 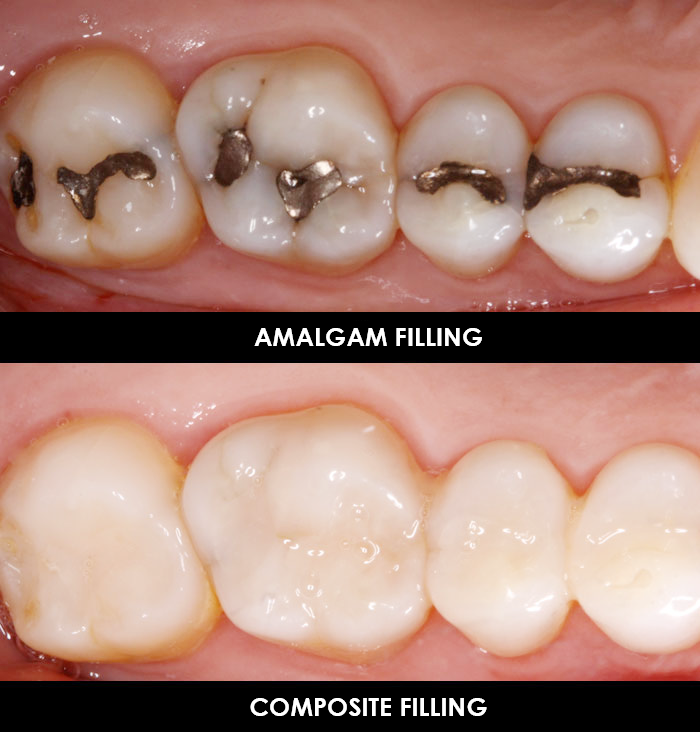 Dr. Danial Kalantari in some cases will recommend amalgam fillings. Some examples are when a cavity is big or close to the nerve. He would recommend silver fillings because they have better resistance against sensitivity. 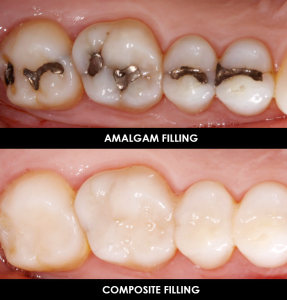 There are some benefits in having an amalgam filling. Silver fillings are durable and long lasting if taken care of properly. The only time that they have to be changed are when they break or have leakage. Silver fillings also work great with people that are heavy grinders. The disadvantage is that more tooth structure has to be remove in order for the amalgam filling to hold. The look of the silver in the mouth is not very esthetic. When the silver filling is on the tooth for a long time it can leave amalgam tattoo. This entry was posted in dentist, santa ana, smiles on bristol, Uncategorized and tagged amalgam fills, dentist in santa ana, santa ana dentist, smiles on britstol dentistry on February 18, 2016 by Francisco Torres. Do you ever wake up with a sore jaw or headaches? If you have ever woken up to this problem, then there might be chance you grind your teeth at night time. This also means it’s a good idea to schedule a dental visit. Your dentist can help you identify if you have a bruxism problem. Most bruxism or teeth grinding can be treated with a night guard. Night guards can be bought over the counter or can be fabricated in a dental office or dental lab. Over the counter night guards are usually universal fit. 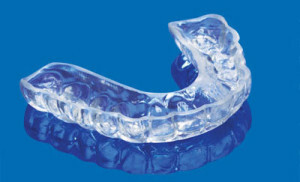 Night guards that are fabricated in a dental office or lab are usually custom made for your mouth. Dr. Danial Kalantari of Smiles on Bristol Dentistry usually recommends to his patients that need night guard the custom fitted night guard. The fit of the custom night guard fits better and retain better in the patients mouth than the over the counter one. There are different types of night guard materials, the material depends on how heavy the grinding is. The most common type of night guard is a soft/hard laminate. The soft material is in the inside part which makes it more comfortable for patients when they apply pressure on the hard outer part. This type of material is for patients that have moderate to severe bruxism. Bruxism or teeth grinding can be caused by anxiety, stress, and frustration. Another reason for teeth grinding or bruxism is malocclusion. When teeth are not in line they create more pressure for other teeth causing some teeth to chip or break. Some medicines are also known to create bruxism. It is best to consult with your dentist if you see any wearing of your teeth. This entry was posted in Uncategorized and tagged dr. danial kalantari, night guard, santa ana, Smiles on Bristol on February 10, 2016 by Francisco Torres. Temporary crowns also known as provisional crown or interim crown are short term crowns used to protect the tooth. Temporary crowns can be fabricated from acrylic material or in some cases aluminum pre-fabricated crowns. At Smiles on Bristol Dentistry Dr. Danial Kalantari usually fabricates acrylic crowns because they look much nicer than the aluminum. These crowns are used to help protect the tooth, stop the tooth from shifting, aesthetic, and shape the gum tissue properly. Temporary crowns are cemented with a temporary cement for easy removal. The temporary cement is strong enough to hold for a couple of weeks. There is some stuff you have to avoid when you have a temporary crown. You have to avoid hard or chewy food; this can affect the temporary crown. Biting into something hard can cause pressure on the crown causing it to break or fracture. Try not to eat on the side of the temporary crown, you can chew with the opposite side of the temporary crown. When flossing carefully pull the floss through not lifting the floss out. Lifting the floss out can cause the temporary crown to fall. What happens if your temporary crown comes off? Your tooth can shift to a different position, or if you’re in the process of a dental crown the gum can grow over the crown preparation. This causes the permanent crown to not fit properly making your appointment longer because the dentist has to adjust the crown to fit properly. 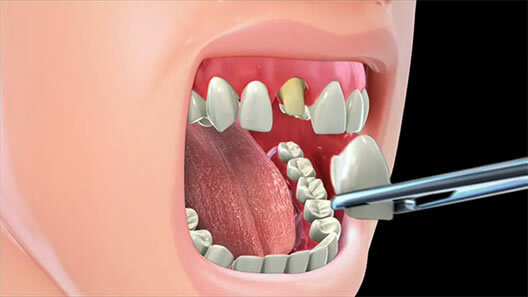 It is very important to get the temporary crown cemented as soon as possible to avoid any complication. Some complications you can face while you have a temporary crown can be sensitivity to cold or hot, redness or swelling around the gum of the crown. These issues are very common when you have a temporary crown. The sensitivity should reduce once a permanent crown is placed. The swelling and redness will also minimize in a couple days after the preparation of the crown. If these issues do not get better with time, make sure you contact your dentist. This entry was posted in Uncategorized and tagged dr kalantari, santa ana, Smiles on Bristol, temporary crowns on February 9, 2016 by Francisco Torres. There are many reasons for tooth discoloration. 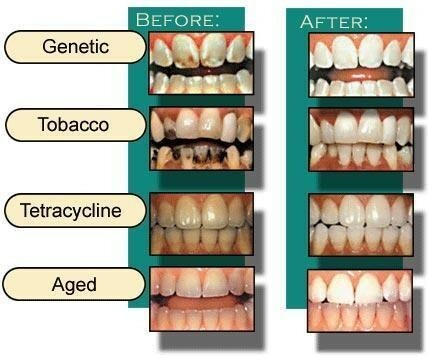 There are extrinsic stains, intrinsic stains, and age related reasons to why teeth begin to lose color. Dark foods and some liquids are also some reasons for tooth discoloration. There are many ways to treat tooth discoloration. One of the main reasons why people see a dentist is because of their teeth changing color. Extrinsic stains are stains that are in the enamel (outer layer of the teeth). These stains are caused by food or liquids. Some liquid examples are coffee, wine, and cola, the enamel part of the tooth have very small pits and ridges and through these ridges the dark liquids stain the enamel. Smoking also causes extrinsic stains. Extrinsic stains are easier to correct, because the stain is in the outer part of the teeth. 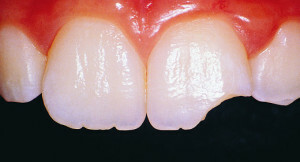 Intrinsic stain are stains that are in the dentin (inner tooth structure). The tooth tends to darken or turn yellow from the inside. This is usually caused by different factors such as medication, trauma, or fluoride treatment. Some medication like tetracycline antibiotics are known to cause intrinsic stains. If you accidentally hurt your teeth for example, a fall can cause the tooth to change color. Having too much fluoride exposure at an early age also stains the teeth intrinsically. For fluoride the stains would usually be white. Intrinsic stains are more difficult to correct because the stain come from the dentin. Age related stains are usually a combination of mixed intrinsic and extrinsic stains. Dentin usually turns yellowish as we age. The enamel part of the teeth tends to wear out with age causing the dentin to be exposed more making the teeth look darker or yellowish. There are many ways to correct tooth discoloration, extrinsic stains are easier to correct. Dr. Danial Kalantari of Smiles on Bristol Dentistry recommends all his patients to brush and floss daily to remove any plaque and to schedule regular cleanings. 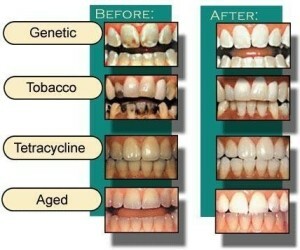 Extrinsic stains and some Intrinsic stains can be corrected by bleaching or whitening your teeth. You can also purchase over the counter products. Over the counter products aren’t as strong as professional whitening products, this means that over the counter whitening material take longer for you to see results. For deeper intrinsic stains the best way to correct is by placing crowns or veneers. Dr. can also recommend dental fillings. This entry was posted in Uncategorized and tagged santa ana, Smiles on Bristol, tooth discoloration on February 8, 2016 by Francisco Torres. At Smiles On Bristol Dentistry we like to prevent caries, how do we that? 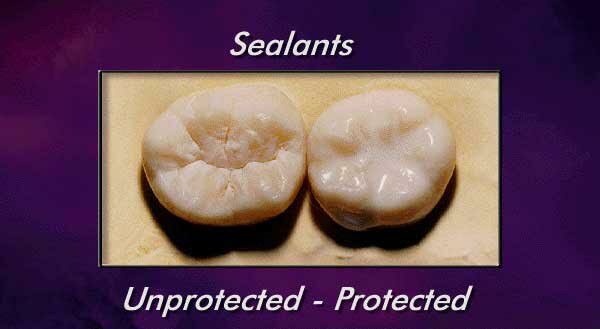 We like to prevent them by applying a preventive called Sealants. What are sealants? Dental sealants are a thin plastic coating that is used seal the pits and fissures so that no bacteria has access to grow in the tooth. These dental sealants are a protection for the tooth’s health, because they are used to seal out both food and plaque. The number one candidates for this treatment are 14 year olds or younger children who have teeth that have not yet been touched by caries. Dental sealants are an easy and fast treatment. As the part of the tooth is thoroughly clean the sealant will be painted on the grooves of the occlusal part of the tooth enamel, as it bonds with the tooth it will create a wall that will protect the grooves( pits and fissures) of all the chewing surfaces. These dental sealants are usually painted onto the molars and premolars as that is where most decay occurs. It has been shown that 40% of the caries incidents are on molars that have deep pits and fissures. The sealants acting as barrier will block any food from being adhere into the grooves. The Smiles on Bristol dentist feels that sealants are important as they help prevent cavities at an early stage. It is also important to have a good oral hygiene, brush and floss your teeth this will remove food particles and plaque that from the smooth surfaces of the teeth. However, a toothbrush will not be able to reach and remove the food particles or plaque from the depressions of the tooth. The Smiles on Bristol team will help by applying sealants and the premolars and molars that have not yet been touched by any decay, by sealing out any food or plaque from these vulnerable areas. This entry was posted in Uncategorized on February 5, 2016 by Francisco Torres. A major news outlet completed a report recently on the top ten cities in America that are home to the most beautiful people around the country. It’s no surprise that California was on the list twice and that Southern California was one of the top ranked cities! Talk to any dental provider and they’ll assure you that a nice smile contributes greatly to beauty. The very first thing people notice about you is your smile, and it’s also one of the factors they base their first impression on. Therefore, it’s reasonable to believe that most Southern Californians are walking around with shiny straight white smiles. One way of achieving a perfect smile is by having straight teeth. Pushing aside the old method of braces using metal brackets, Invisalign is now the easier and more convenient way to achieve a perfect smile. The concept behind invisalign was to straighten teeth using an invisible method. The clear aligner trays are custom fitted and measured to comfortably be worn by each individual. When it comes to straightening your teeth, it’s no longer necessary to seek out an orthodontist. Rather, Invisalign can be superiorly completed by a Dentist. Dr. Kalantari has said that since opening Smiles on Bristol Dentistry, in Santa Ana, he’s amazed by the high number of calls he gets on a daily basis regarding invisalign. Dr. Kalantari highly encourages patients to schedule a consult to determine the best coarse of treatment based on each patient’s unique case, to determine a comfortable coarse of treatment to achieve the desired results. When deciding whether or not to start invisalign, it’s best to make the decision with confidence. Like most things attributed to better health and beauty, invisalign does require a patient to care for their teeth and proactively ensure that they’re wearing their aligners. Typically, treatment can last up to twelve months for most adults. However, that length can be different depending on the severity of the patient’s case. As for teenagers, the dental provider will plan out a course of treatment, appropriate to the patient’s needs. Regular appointments are scheduled abut once every four to six weeks. Each appointment will evaluate the change and progress the patient experienced in between visits. Aligners are most effective when they’re worn to meet the required amount. Generally, it’s best the aligners are work between 20 to 22 hours a day. It’s strongly suggested the aligners only be removed for cleaning, eating, and brushing. One of the greatest benefits to getting invisalign rather than going with the old-method braces is that your friends can hardly tell you’re wearing them! 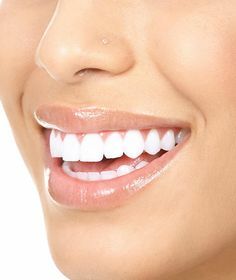 Considering that they were originally invented to correct smiles through an invisible process, the fact that there are no metal brackets makes them incredibly desirable by almost all patients! The Invisalign aligners are also patient friendly, in the sense that they can be removed at any time without the patient having to visit the Dentist! They can easily be removed for eating and drinking at any time and then immediately placed back in, after the patient has brushed! This entry was posted in Uncategorized and tagged Invisalign, santa ana dentist, Smiles on Bristol on February 2, 2016 by Francisco Torres.